Rosemary A. Lester-Smith, Ph.D., CCC-SLP, is an Assistant Professor in the Department of Communication Sciences and Disorders at The University of Texas at Austin. She received a B.A. in Speech and Hearing Sciences from the University of New Mexico, M.A. in Speech and Hearing Sciences from Indiana University, and Ph.D. in Speech, Language, and Hearing Sciences with a minor in Neuroscience from the University of Arizona. She completed postdoctoral training at Mayo Clinic, Boston University, Northwestern University, and Shirley Ryan AbilityLab (formerly Rehabilitation Institute of Chicago). 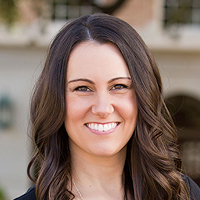 She is a certified speech-language pathologist and has worked in a variety of clinical settings, primarily evaluating and treating adults with voice and swallowing disorders. Dr. Lester-Smith’s research aims to improve the diagnosis and treatment of neurogenic voice disorders including vocal tremor. She uses acoustical, perceptual, and physiological methods including endoscopy and electromyography for her research. In addition, she uses computational models to simulate vocal tremor, perturbation of voice auditory feedback to study auditory-motor control, and single-case experimental designs to evaluate the effectiveness of voice therapy. Her research has been funded by the National Institutes of Health and the National Institute on Disability, Independent Living, and Rehabilitation Research.